The Zip Along 12 project provides a place to share, celebrate, and learn about student history projects centered and their community. Every community along US 12 has its own rich historical resources and unique stories to tell. At all grade levels, exploring local history is a great way to enhance classroom learning, get students involved in their community, and develop a broad range of important skills. It is also a great opportunity to build relationships with historical organizations in your community. 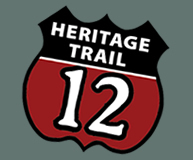 The US 12 Heritage Council can help your school develop their own local Zip Along 12 history project. If you are interested in setting one up in your community, please contact us.